My name is Benjamin Mewis and my wife and I had the privilege of adopting from your agency in December of 2009. We adopted a beautiful little Boxer whose name was Comet. 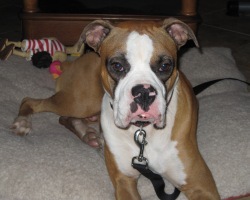 Neither my wife or I had ever had a Boxer as a pet before and knew little about the breed. As soon as we saw Comet that day, we fell in love with him. We also have a Basset Hound named Athena. We also brought Athena to meet Comet that day and she fell in love with him as well. I will never forget walking into Comet’s foster parent’s home and Comet greeting us right away. Comet walked right over to Athena and began licking her in her mouth and playing with her. Comet would do this daily for the rest of his life and my wife and I joked that he was giving her kisses all of the time. We would walk Comet and Athena around the neighborhood and Comet would always encourage Athena to walk a little longer with him. Comet met several other dog friends and neighbors on his walks and frequently passed by a daycare center on his walks. All of the children at the daycare center would run over and pet Comet every time that they were able to see him and it seemed like it made their day. Comet was also my running buddy. He would encourage me to run on days that I did not necessarily feel like it and would set the pace for me on the runs to keep me going. Last week after sudden kidney failure my wife and I made the difficult decision to put him down. My wife and I held his muzzle in our arms and said goodbye as he drifted off to his eternal slumber. We will always remember Comet as our eternal puppy and will always be grateful for the day that he came into our lives. Mom, Dad and Athena will miss you.